Acupuncture was performed on Sophie, a 9 year old warmblood mare used for dressage. Sophie had SI and stifle pain treated successfully with a combination of acupuncture, chiropractic, and traditional medicine. Sophie, a 9 year old warmblood mare used for dressage, was presented for poor performance, worse when performing to the right. Sophie was purchased by the owner almost one year ago to be used as a dressage horse. Prior to this she was not used for a very athletic career so her work level has increased dramatically in the last year. She was positive to hock injections on her prepurchase and hocks were injected shortly after she was purchased. She has done well in her transistion to a career in dressage, but as the work level increases she has had a harder time using herself for various movements (haunches in, small circles to the right, extended trot, etc). Lameness exam has been performed and Sophie is mildly positive to flexions of her stifles, but is not lame on baseline and shows no lameness under saddle, just more reluctance going forward when on the right lead. Lameness exam was performed with little significant findings. Sophie was mildly positive to stifle flexions so stifles were radiographed and ultrasounded but no abnormalities were found on imaging. Myofascial exam reveals very limited lateral movement through flexion of neck bilaterally. Sophie has trigger points through the medial aspect of her scapula on the right. Confomationally she is long through her back and high in her croup. She is very sensitive to palpation of epaxial muscles worse in the lumbar region and very sensitive to palpation over SI and gluteal muscles bilaterally but worse on the right. She is also sensitive to palpation of ST7 over TMJ bilaterally. Medical Decision Making: Based on myofascial exam, Sophie is most sensitive to palpation of lumbar and sacral area. This combined with her poor performance would indicate lumbosacral pain, making it hard for her to collect and perform some of the advanced dressage movements that she has had difficulty with lately. Neuromodulation aimed at stimulating mechanoreceptors to alleviate pain and increase neurotransmission especially to lumbar spinal nerves and sacral spinal nerves. Due to the difficulty of imaging this area in horses a definitive diagnosis was not made, though history and lameness exam combined with myofascial exam are indicative of SI and/or LS pain. Sophie was treated with the following acupuncture protocol once monthly for 3 months (three times total so far though owner plans to continue monthly treament). Additionally trigger points found on myofascial exam were treated with dry needling using 15mm 0.23mm coated needles. After initial treatment owner felt that Sophie was easier to get to move forward to the right. She did ride with more energy and was more flexible through her neck. 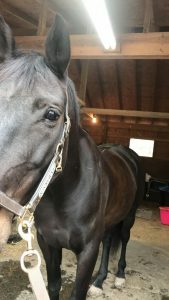 She seemed to have the most improvement after the second course of treatment, after which her owner took her to a horse show and said she felt the best she had felt since she purchased her and she received her best dressage scores. On myofascial exam she was not nearly as reactive to palpation of SI and lumbar area, and was more flexible through her neck on lateral flexion (owner had been working on stretches since initial treatment). We had discussed SI injections for Sophie, but she has responded so well to acupuncture treatment that we have decided to hold off on injections at this time and hope they will not be needed if she remains on a regular acupuncture schedule. As an equine practitioner I am very excited to be able to add acupuncture to my “toolbox”. I see a lot of lameness cases and they are not always responsive to traditional treatment with NSAIDs, joint injections, etc. I have found that in using acupuncture I am able to get more longevity out of my joint injections when I do choose that method of treatment. 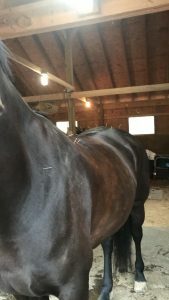 Often times I am also able to use acupuncture to achieve the same effect for horses who are unable to receive joint injections due to systemic disease (PPID, EMS, etc) or due to owners financial limitations.